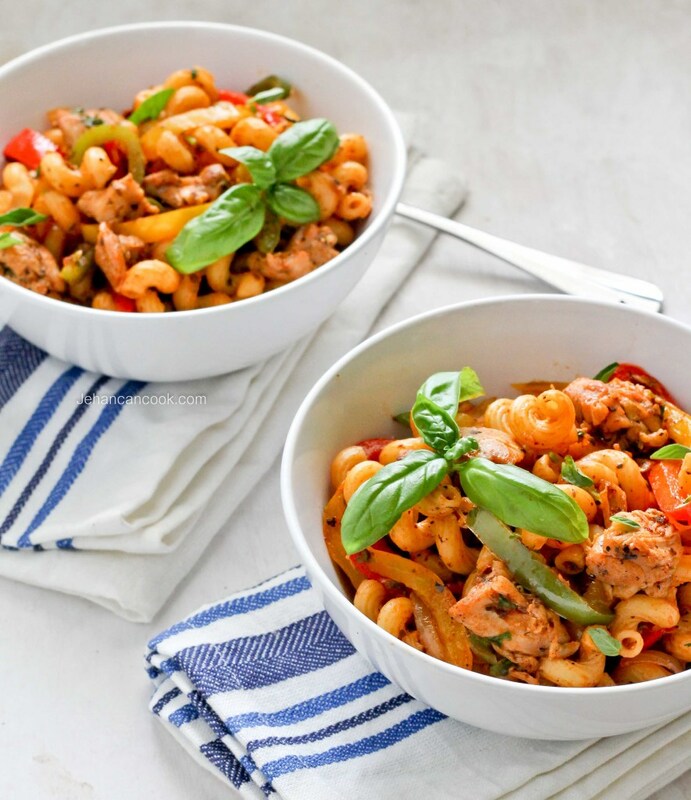 This simple pasta dish has been a longtime favorite of mine. I love pasta, but don’t cook it often enough as I’m always inclined to add cheese and while I’m a huge lover of cheese, I do try to cook with it as little as possible. For me pasta almost always has to have cheese, so you can see how this is a problem. What I love about this dish is the fact that it’s so good on its own that I don’t miss the cheese! 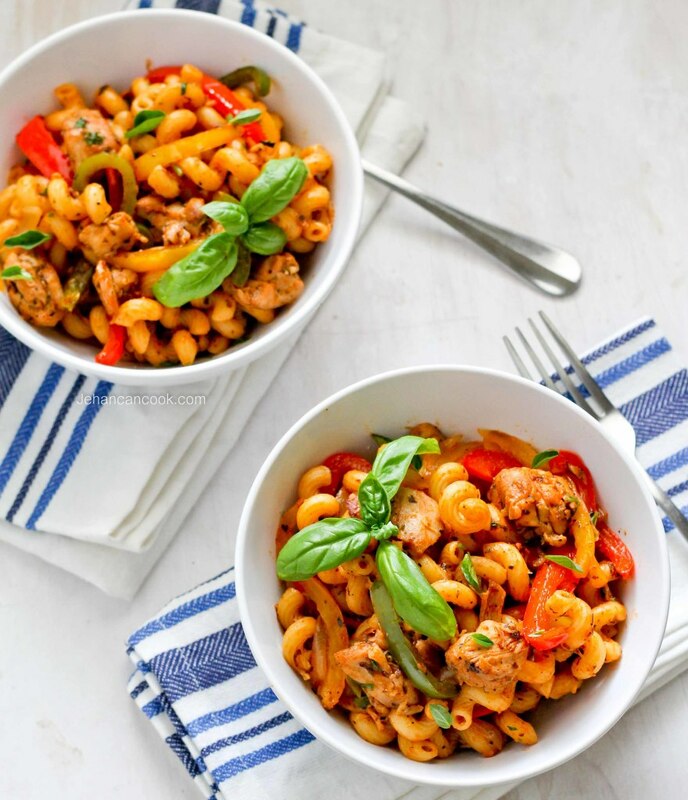 Boneless thighs are sautéed with lots of herbs and peppers making a saucy stew which is then tossed with pasta. The key to this recipe is to under cook the pasta just slightly then add to the stewed chicken, cooking it for an additional 5 minutes, allow it to soak up the sauce. It’s a simple, no fuss, inexpensive dish that’s perfect for a weeknight meal and the kids will approve! I used peppers but zucchini, thinly sliced carrots and spinach would be great also. Cook pasta making sure it’s just a bit undercooked; the pasta will cook until done in the sauce. 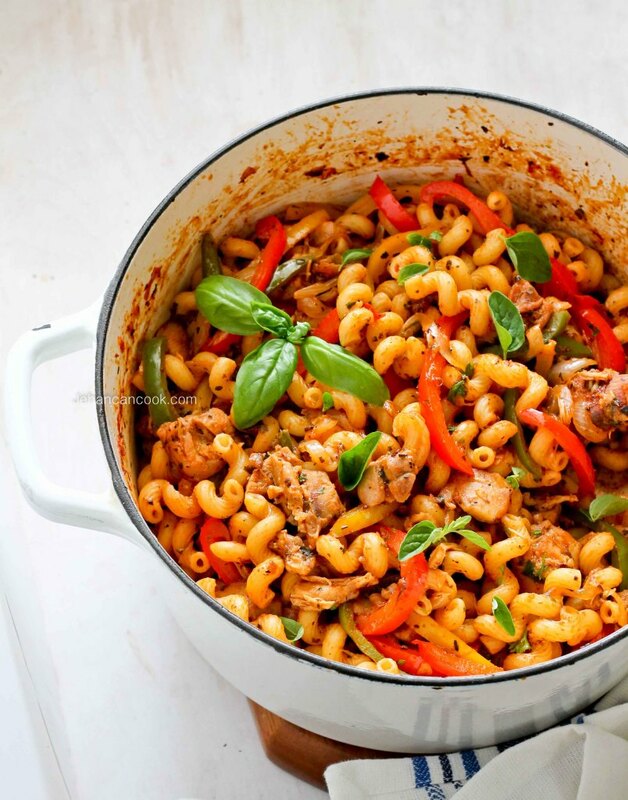 While pasta cooks, mix chicken pieces with salt, black pepper, oregano, basil and parsley. Heat oil over medium heat, in a pot large enough to hold pasta. Add seasoned chicken and cook until the pieces are brown. Next add onion, peppers, and garlic and cook until softened, about 5 minutes. Add tomato paste, ketchup, sugar and water and cook until the sauce reduces and thickens. Add strained pasta to the pot with the chicken and stir to combine. Cook for an additional 3-5 minutes until the pasta soaks up the sauce. Add fresh basil to garnish. Pingback: One-Pot Tomato & Spinach Pasta, a quick, convenient & delicious family meal! This looks amazing, can’t wait to try this recipe! I’ve been using a few of your recipes exactly how you instructed and every time my food hits the spot! I love the way you are able to maintain the authentic Caribbean flavours even when you suggest alternative ingredients (let’s just say the supermarkets in West London aren’t adequately stocked)!